Ms. Munchie's favorite coffee shop changed names for a morning. 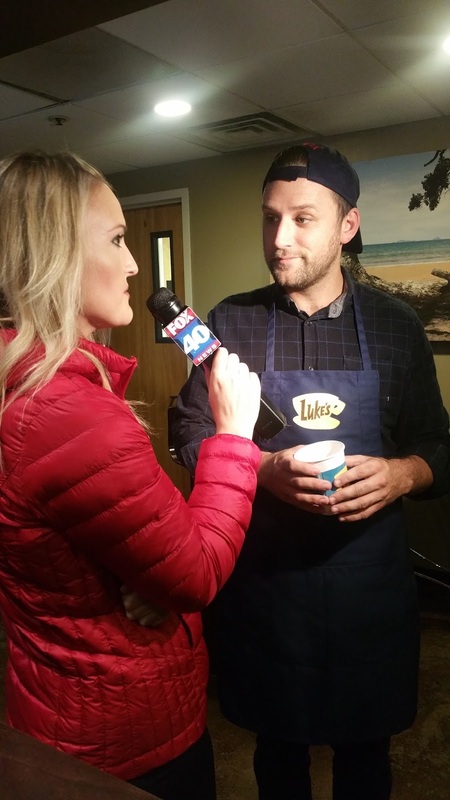 This morning Chocolate Fish Coffee became Luke's Diner from the TV show, Gilmore Girls. I became a Gilmore Girls fan a little late. I didn't discover it until the second or third season. I was immediately captured with the excellent script writing and delivery by the actors. This was a more cerebral show with very quick repartee. Sometimes so quick it was hard to keep up. The script writing was right up there with The West Wing and I loved it. It was a sad day when it ended it's run, but it's coming back! Netflix has revived it for a four episode run that will be posted on November 25th. But what about October 5th? Well, that was the original air date of the series and so today is its anniversary. Netflix teamed with over 200 coffee shops to become Luke's Diner for the day. In Sacramento, it was Chocolate Fish Coffee at its CalPERS location downtown and also at The Trade Coffee. Edie Baker, owner of Chocolate Fish, said they chose the downtown location to give it a bit more exposure. State workers are well aware of the original Chocolate Fish location, but maybe not enough downtown/midtown residents. 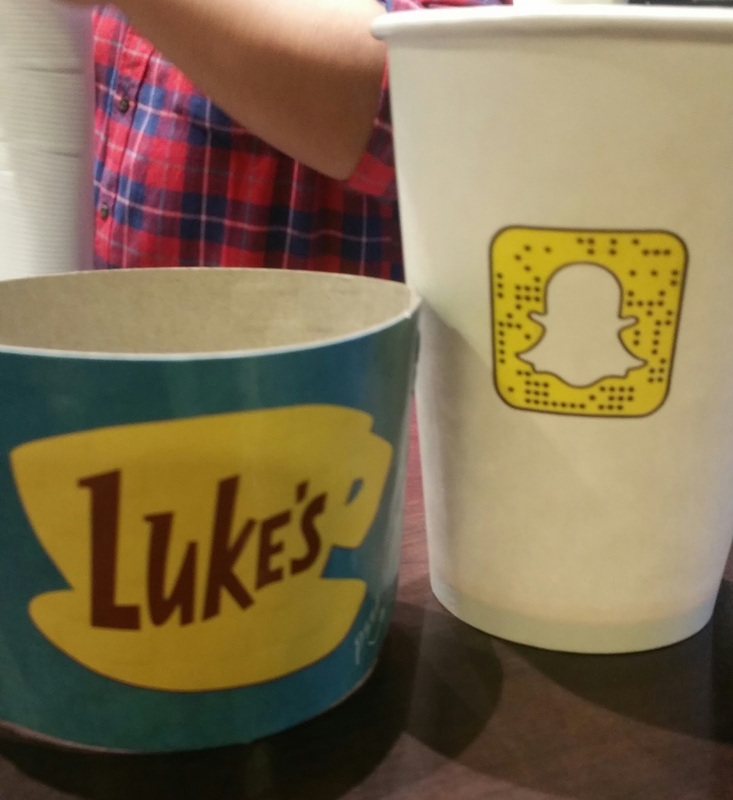 Netflix is reimbursing the stores for their coffee sales during the promotion. They also supplied promotional collateral such as cups and sleeves. 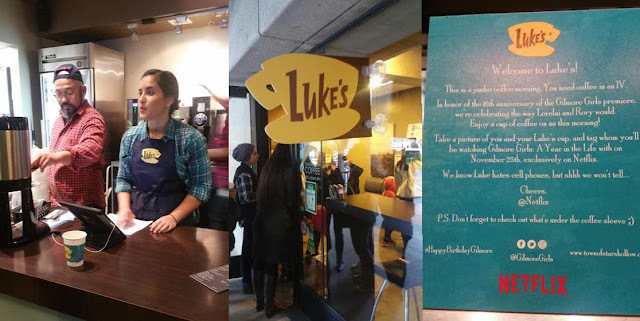 I don't know about The Trade, but the Chocolate Fish location even had their own Luke! Jason, a Chocolate Fish employee who looks remarkably close to Luke, played the part for picture takers and the media. 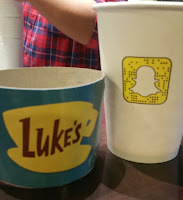 The cups had SnapChat codes on them that supposedly unlocked special Luke's Diner filters, but I couldn't get mine to work. 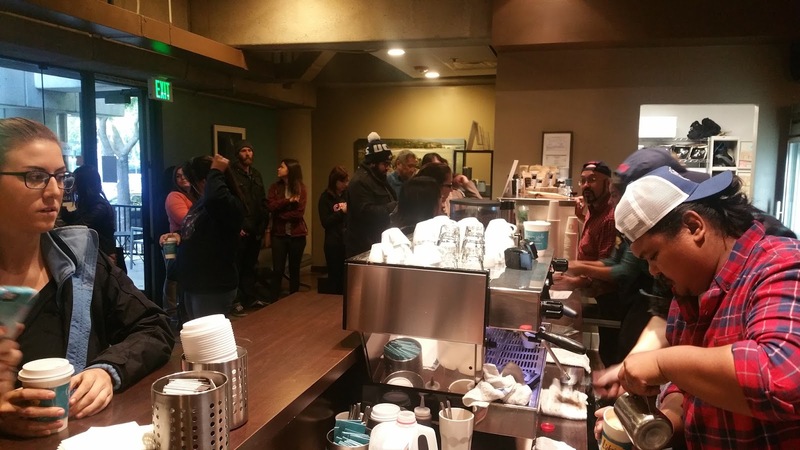 In the end Edie tells me that they gave away 250 cups of coffee and 500 logo cups. At 8 a.m., when I stopped by, the line was past the patio and down the block. After my gym class I did a drive by and it was still the same at 10 a.m! I was told that The Trade's line was also around the block. Apparently there is a large Gilmore Girls following in Sacramento!